A Must-Watch Webinar for Technical Working Group Members - Professional Association Management Company | Virtual Inc.
Technical working groups/consortia play a crucial role in the technology standards arena, but TWG progress isn’t always what it could be. The lack of strong leadership and clear procedure often makes it difficult for busy volunteers (spread across different geographies, no less) to stay organized. Meanwhile, technical working group projects may suffer from poor meeting attendance, role confusion, or chronic delays in decision making. We see it happen a lot. 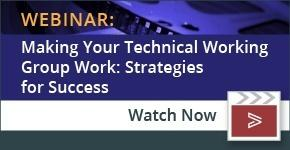 So we put together this webinar, to address the most common pitfalls. Do you have the right chairperson in place to drive your TWG standard? Our experts list some important questions to ask, along with practical suggestions to ensure adequate leadership training, coverage, and succession planning. If you want to get the most from new players, you need a standard onboarding process or formal orientation that can provide the necessary context. Our webinar dives into orientation components and technology options for streamlining this process. What kinds of rules do you need to decide early on (or else right away) so you don’t thwart progress? Get the answer to that question and others on procedural best practices, like: When do formal votes make sense versus simple consensus? An effective TWG meeting agenda should be more than a laundry list. Hear our experts discuss what members need to know beforehand, in order to come prepared and stay engaged. There’s a right way and a wrong way to connect your TWG via conference call. Are you using the right platform provider? Learn the basics for maintaining a standing “Decision Log,” and how it should be used to save time for everyone. Your email inbox is not a consistent, reliable system. It’s absolutely critical that you maintain uniform systems for document storage, ballot tracking, and more. Why are face-to-face meetings so much more effective than remote meetings—particularly for TWGs? Our webinar dives into F2F advantages and best practices, with a specific focus on the needs of technical working group participants. Have your TWG deliverables lost touch with Board strategy? Hear more about keeping directors apprised with steady and ongoing conversation. Take ten minutes to take a look at our TWG webinar, featuring first-hand insights from myself and Greg Kohn, Virtual’s vice president of client services. Watching is an easy way to begin fine-tuning your standards group through collaboration, coordination, and of course, the right technology tools.